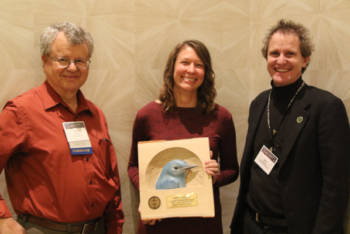 Partners in Flight (PIF) Awards recognize exceptional contributions to the field of landbird conservation in the Americas in the categories of Leadership, Investigations, Public Awareness, Stewardship, and Lifetime Achievement. that improve our understanding of avian ecology, habitat management, or other scientific factors important to the PIF initiative. 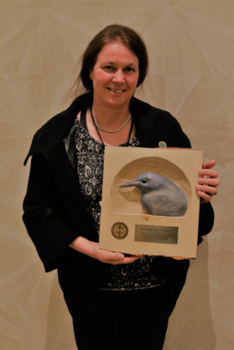 Award on behalf of the Great Basin Bird Observatory. Elisabeth is the GBBO’s Executive Director. throughout the expansive Great Basin would have been largely uninformed by multi-species scientific data on landbirds. that contributes, or has contributed to, advancing PIF conservation efforts. Wildlife & Natural Resources Conference in Virginia, with Greg Butcher (left) and John Alexander (right). 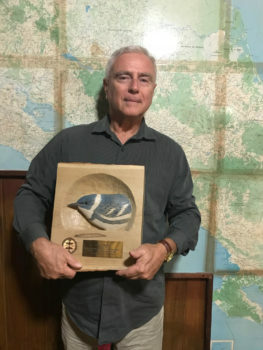 Robert Elner accepted his 2017 PIF Leadership Award at the 27th International Ornithological Congress in Vancouver, British Columbia. Also pictured is Wendy Easton. development organizations in the tropics of Mexico, as well as a key active member of several international conservation networks. on leadership roles in PIF, including the Western Working Group, and within other conservation focused initiatives. She embodies all things PIF. 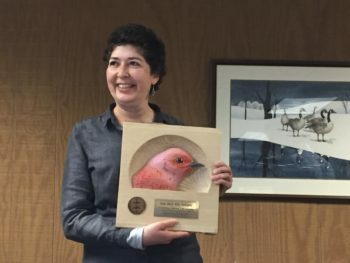 For his outstanding guidance and leadership to build the scientific foundation and advance the conservation of migratory birds in Canada and along the flyways of the Western Hemisphere. 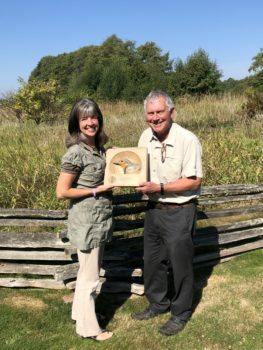 In his role as the Research Manager at the Canadian Wildlife Service, Bob launched the inaugural meeting of PIF in Canada in 1998 and started Canada’s first PIF program in British Columbia. Soon after, he supported Canada’s first full-time regional PIF coordinator, a position that still exists today as Canada’s only permanent PIF position. This program developed Canada’s first Bird Conservation Region (BCR) plan in 2003, a forerunner and template for the nation’s wall to wall BCR plans developed for all birds a decade later. awareness and appreciation for birds, their habitats, or the need for conservation. 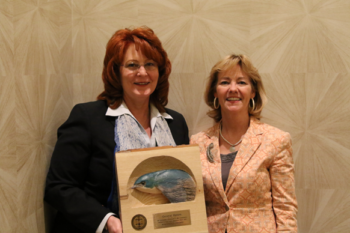 Susan Kelsey (left), GM Global Biodiversity Program Manager, accepted the 2017 PIF Public Awareness Award for GM at the North American Wildlife & Natural Resources Conference in Virginia. Also pictured is Emily Jo Williams. 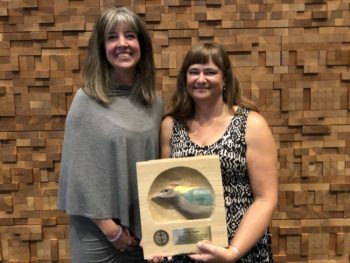 Nicola Koper (right) accepted her 2017 PIF Public Awareness Award at the 27th International Ornithological Congress in Vancouver, British Columbia. Also pictured is Wendy Easton. regularly engage in landbird conservation and outreach activities, including through the installation and monitoring of artificial nesting structures. Species identification and inventory events are scheduled in conjunction with national bird counts or as educational opportunities for local schools. For her work in bringing birds and people together, linking avian science, monitoring and conservation with Grenadian communities. Nicola, a full professor in the Natural Resources Institute at the University of Manitoba in Canada, initiated the first systematic landbird banding program in the Caribbean nation of Grenada over four years ago. Since then the project has grown steadily in scope, innovation and impact and is now of significant value to Grenada, integrating local communities into the bird surveys, along with outreach and educational opportunities. conservation, or restoration of landbird habitat or species of concern. Erick Berlin receiving his 2017 PIF Stewardship Award, delivered in person by Ken Rosenberg, at the Las Brisas Nature Reserve in Costa Rica. For his restoration of vital stopover habitat for two of PIF’s highest priority bird species, the Cerulean Warbler and Golden-winged Warbler. Erick, a US-born citizen who has resided in Costa Rica for four decades, created and owns/manages the private Las Brisas Nature Reserve in Costa Rica. His careful stewardship efforts have resulted in an accelerated regeneration of native forest, making the area the most significant stopover site discovered for the Cerulean Warbler to date. Do you know someone who has made major contributions to landbird conservation? Nominate an individual or group for a Partners in Flight Award!